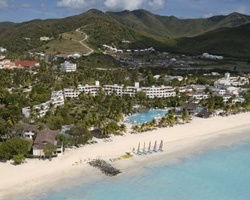 Antigua's *Jolly Harbour Beach Resort* offers the perfect location for the perfect vacation. On-site, guests can enjoy private beaches with a mile of white-powder sand, an 18-hole golf course, seven restaurants and bars, a shopping mall, tennis, a host of water-sports activities, casino, and marina facilities. 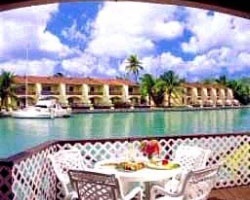 Waterfront, 2-story villa with 2 decks that overlook the water! Presidents Week in red season, 99 year lease! Free golf cart per visit! Make offer!